Everyone in London was frocking out for Fall Winter 2010. Girlishness is in – whether it’s the sweet girl next door or the bad girl of the rock star variety. It doesn’t matter what type of girl you are – the London lot of designers want you to look like one. 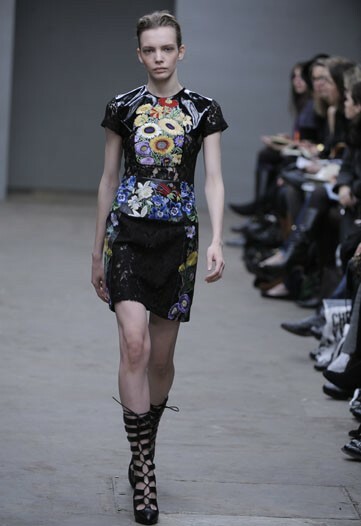 Erdem Moralioglu continues his floral fancy for Fall. 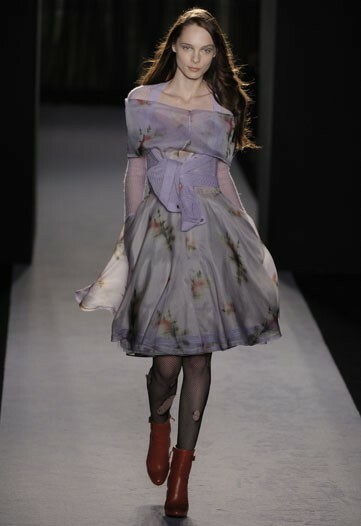 While Erdem is known for his optical floral prints, a few others took a walk down the garden path also. Surprisingly, one of them was Christopher Kane. Yes, the sunflowers are on black patent leather, but still they are flowers! Auntie Viv optimized her florals and colours for maximum impact. These are more colours than I wear in a week, but I adore the in-your-faceness of the look. She certainly doesn’t bore you, does she? As a side note, promptly after this show, Ms. Westwood advised us to put an end to consumerism and to not buy any of her clothes. Oh, to have a pot of tea with my Auntie Viv one day – if only to intently listen to the best British accent. Ever. Speaking of proper Brits, Mr. Smith has come for dinner and he’s brought a few ladies with him. What’s a frock without some flounce, I always say. The rest of the collection was very English as well…I’ll show you more of that in context as the Fall Fashion Weeks actually start to contextualize as a unified story or three. Softeness at Paul Smith, neatly belted. The florals got curvier at Berardi – a man who knows how to cut a piece of fabric. The panel chooses this panelled dress by Antonio Berardi FW10. I love the echo of this past Fall and Spring’s big shoulder, the brocade mixed with what can only be a stretch crepe or jersey – it makes a vintage-y fabric wearable and young. The slit is perfect in its asymmetry and that neckline? That neckline is divine beauty. You wouldn’t catch me in sheer hose and pumps with a dress, so I’d wear this with a pointy, butter-soft leather stiletto boot – in a forest green if I could find it – or in black, in a pinch. And remember that Tom Ford for Gucci long to there clutch? Can’t you see it here, held by the tip, sashaying with your walk? This other option, also from Mr. Berardi is more true to his form – more structured and angular – but those angles never interfere with a woman’s curves. One of my favourite things in my own closet is a Berardi suit. A complex form is as simple as black and white at Berardi FW10. So, the London lesson for today is that frocks are props for all walks of life. Mind your manners and pick up a few. Please and thanks. Oh, but not Auntie Viv’s. We don’t want to be all consumer-y. Westwood image from Style.com. All other images from WWD.